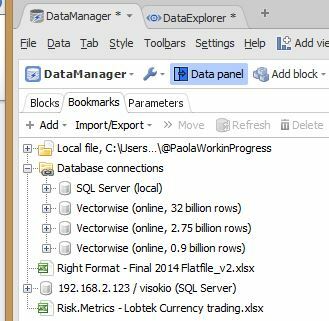 In Omniscope 2.9 we have added the ability to Import, export and link to DataManager bookmarks. These options are available in the "Bookmarks" tab in the data-panel. Import bookmarks. This option allows you to import all the bookmarks saved in a bookmarks XML file. This file can be located on your own computer, on a network location or somewhere in the cloud. Any bookmarks that you import will be embedded in your local bookmark file, so any edits you make will be made locally and will not edit the bookmarks XML file. Link to bookmarks.This option allows you to link to a bookmark XML file. You can link to a file on your own computer, a file on a network or a file somewhere in the cloud. Linked bookmarks cannot be edited, and are updated every time you open DataManager. You can trigger a manual refresh by selecting the linked bookmark and clicking the "Refresh" button in the bookmarks toolbar. If the linked bookmarks file is deleted they will no longer appear in your bookmarks the next time the list is updated. Linking to bookmarks allows you or your company to create a central bookmarks file that can be managed by an administrator and linked-to by multiple Omniscope users. If, for example, a database password changes, only a single update is required to propagate that change to all users. Export all bookmarks/Export folder. These options allow you to export all your bookmarks or a selected folder to a bookmarks XML file. After exporting, other Omniscope users can either import or link to the bookmarks. You can choose to export bookmarks to your local computer, a network location or somewhere on the cloud. Any passwords defined in any of the sources or outputs that you export will be encrypted. Please let us know if you have any questions or ideas for improving this feature.